The weather hasn’t cut us much slack this week with all of the rain and it doesn’t look like the weekend is going to be much better. Sheepshead are slowly disappearing, but you should still be able to go out there and catch a few. This might be a good time to look for them on the shallow water wrecks in the Gulf. Fishing the flats for speckled trout and redfish is getting better each week, so it’s definitely worth giving a shot. We are pretty much in the dead middle of cobia season right now and reports will drastically vary from one angler to another, but there are quite a few fish being caught on a daily basis. Amberjack and vermillion snapper continue to be the primary targets of those venturing offshore looking for bottom dwellers that they can keep. Good numbers of king mackerel have showed up around many of the wrecks in the Gulf so that’s a good option if you’re looking to have some steady fun. This is a great time of year to try your luck on the Pensacola Beach Gulf Fishing Pier or Navarre Beach Fishing Pier. 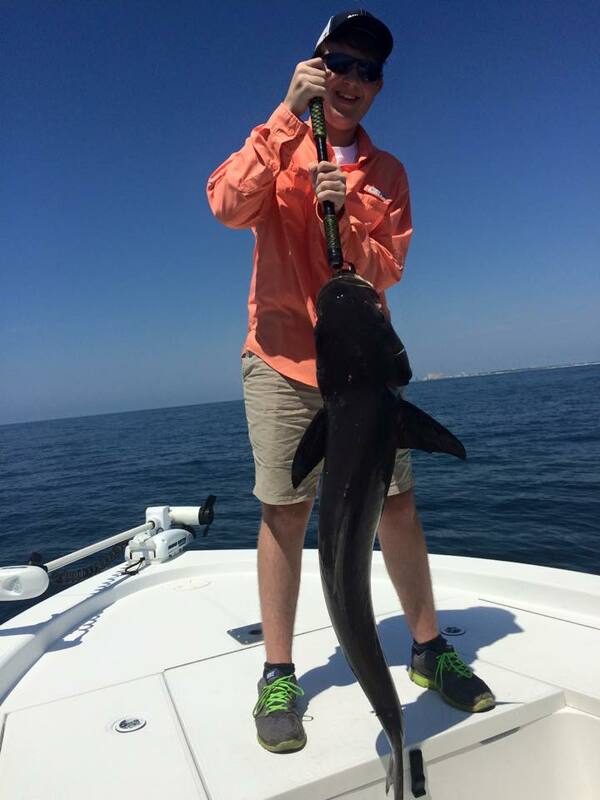 Cobia, pompano, and king mackerel are being caught almost every day so you’ll have to decide what you want to target. Fishing in the surf off the beach is another good option for land locked anglers. Pompano will be your primary target, but you might also luck into a redfish, sheesphead, or black drum. According to a few reports it sounds like the bass fishing has been really good in the lakes lately, especially if you’re just looking for the big ones. A few anglers are also concerned that the heavy amount of rain we’ve received is going to dirty up the river water and make for some tough river fishing.